After going through Blogmas, I realized how much I enjoyed writing to a theme of something. I was trying to think of how I wanted to start the new year off, writing/substance wise. I have been dealing with some emotional issues the last few weeks. However, I didn’t want to start off the new year with all the negativity. Part of me working on myself is focusing on positive things. So I came up with this theme as I was just laying here with a song stuck in my head. Everyday, for the month of January, I am going to write about one song. It will be the song that is stuck in my head that day, because let’s face it I always have at least one. I will try to insert or link the song if possible, but will for sure have the lyrics for you. It is 245am and I, like I said, have been dealing with emotions. I then started browsing my Pinterest, for no real specific reason. I saw my board titled “rhythms of my soul” and clicked on it. I was scrolling through the different chorus lines, or what have you, of the various bands and songs that I like. But for some reason, a different song popped into my head. Apparently this is a lesser known song of this band because it was nowhere to be found on Pinterest. This song brings me back to high school. I listened to this song a lot and can sing it word for word. Sometimes I like to pretend I know how to rap 😂 (not freestyle, just with the songs). 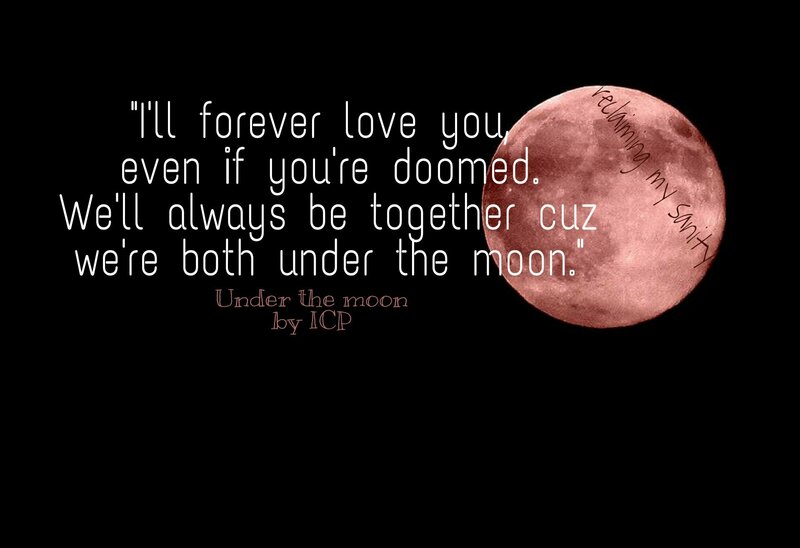 So here we have the song Under The Moon by the insane clown posse (ICP). I never understood it was I even worth your while? Cool idea. I hadn’t heard this song before. I didn’t realize not a lot of people know this song of theirs! The other song I know of theirs is the dating game. Otherwise I don’t think I know many of their songs to be honest. I think I was too sheltered in my small town in the 90’s to have actually heard any ICP stuff. The only reason I did was the guy I was dating at the time. I had heard of ICP at school because we weren’t allowed to wear anything with them on it, but never listened to them until I was with him. I can imagine how many songs and bands that I have never heard of are out there!